The workshop was a success as around 50 delegates attended this one day workshop. Get all important informations concerning VISA here. Invitation letters are handled by UCL: If you require confirmation of your registration and attendance at NetSoft 2015 in support of your visa application then please email: netsoft2015-support@ee.ucl.ac.uk. 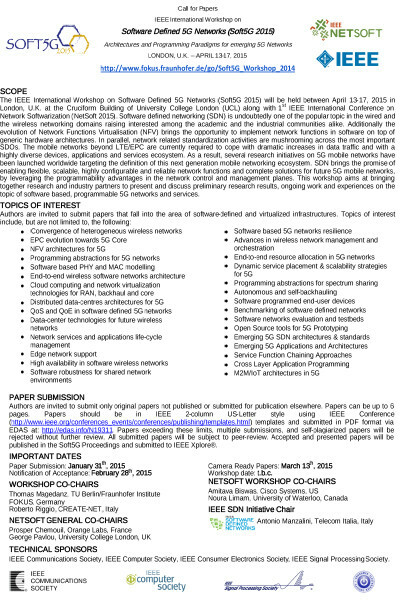 The first IEEE International Workshop on Software Defined 5G Networks (Soft5G 2015) will be held on April 17, 2015 in London, U.K. at the Cruciform Building of University College London (UCL) along with 1st IEEE International Conferenceon Network Softwarization (NetSoft 2015). Software defined networking (SDN) is undoubtedly one of the trending topic in the wired and the wireless networking domains raising interested among the academic and the industrial communities alike. Additionally the evolution of Network Functions Virtualisation (NFV) brings the opportunity to implement network functions in software on top of generic hardware architectures. In parallel, network related standardization activities are mushrooming across the most important SDOs. The mobile networks beyond LTE/EPC are currently required to cope with dramatic increases in data traffic and with a highly diverse devices, applications and services ecosystem. As a result, several research initiatives on 5G mobile networks have been launched worldwide targeting the definition of this next generation mobile networking ecosystem. SDN brings the promise of enabling flexible, scalable, highly configurable and reliable network functions and complete solutions for future 5G mobile networks, by leveraging the programmability advantages in the network control and management planes. 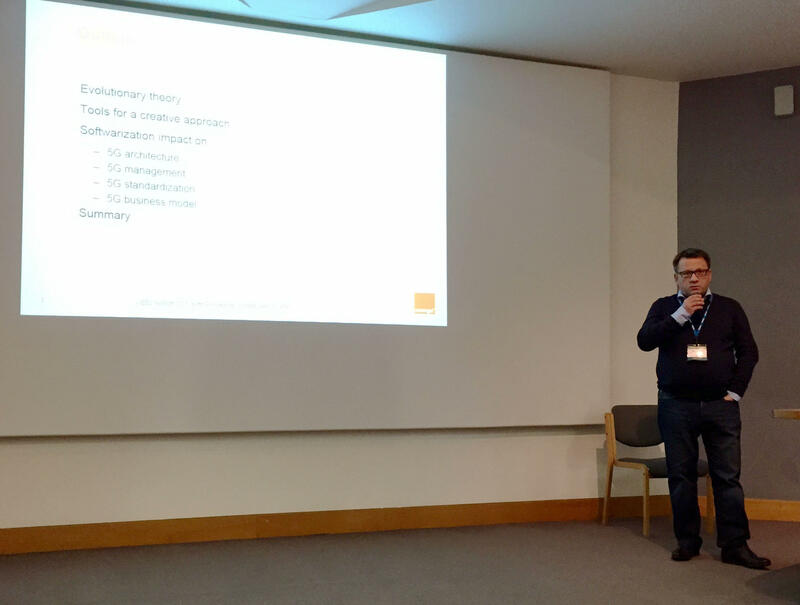 This workshop aims at bringing together research and industry partners to present and discuss preliminary research results, ongoing work and experiences on the topic of software based, programmable 5G networks and services. Authors are invited to submit only original papers not published or submitted for publication elsewhere. Papers can be up to 6 pages. Papers should be in IEEE 2-column US-Letter style using IEEE Conference templates and submitted in PDF format via EDAS at: http://edas.info/N19311. Papers exceeding these limits, multiple submissions, and self-plagiarized papers will be rejected without further review. All submitted papers will be subject to peer-review. Accepted and presented papers will be published in the Soft5G Proceedings and submitted to IEEE Xplore®. Prof. Magedanz has been carrying out pioneering research and teaching globally recognized education courses for masters, diploma and PhD students in the field of converging fixed and mobile telecommunications, the Internet and information technologies for over 20 years. In this context he has initiated and managed numerous national and international R&D projects centered around Next Generation Service Delivery Platforms on top of both legacy and Next Generation Networks based on worldwide recognized technology testbeds. Dr. Roberto Riggio is currently Senior Researcher staff member in the Future Networks team at CREATE-NET, Italy and guest Lecturer at the University of Trento. He received a PhD in Communications Engineering from University of Trento, Italy, in 2008. His research interests include performance isolation in multi-tenants data-centers; software defined mobile networking and programmable 5G networks. Dr. Riggio has co-authored more than 50 papers in internationally refereed journals and conferences. He serves on the TPC of leading conferences in the networking field, including, e.g., IEEE INFOCOM, IEEE IM, IEEE NOMS. He is co-inventor of two patents on network virtualization and distributed network monitoring. Dr. Riggio is the co-founder of the IEEE workshop on Software Defined 5G Networks. Dr. Stefano Salsano, University of Rome "Tor Vergata"
Dr. Tarik Taleb, NEC Europe Ltd.
IEEE Communications Society, IEEE Computer Society, IEEE Consumer Electronics Society, IEEE Signal Processing Society.